Electric heaters are used in a variety of processes where the temperature of an object or process needs to be increased. For example, lubricating oil need to be warmed before it is fed to a machine, or, a pipe might need heat tracing to prevent it from freezing in the cold. Electric heaters work by converting electrical energy into heat. The heat is then transferred to the process through various forms of heat transfer. OMEGA Engineering offers a wide range of heaters in Australia. Convective: Convective heat transfer occurs when heat is transferred due to the motion of a fluid (such as a liquid or gas). There are two primary forms of convection, free convection and forced convection. Free convection occurs when the fluid naturally flows due to heat gradients. For example, hot air rises, and cold air sinks, so natural convection describes the tendency for hot air to move above cold air. As the air is in motion, some of the heat from the hot air is transferred to the cooler air. Forced convection describes situations where an external force is used to accelerate the flow of a fluid. Using a fan or stirrer to create movement in a liquid or gas would be an example of forced convection. Conductive: Conductive heat transfer is the most common method of heat transfer for solids. As heat is transferred to a solid, the microscopic atoms (or particles) that form the solid, begin to get hotter and vibrate more rapidly. The energy from the vibrations is transferred to neighboring atoms, which begin to get hotter as well. Conductive heating is typically used on solids since they have a dense, repeating molecular structure. Radiant: Radiant heat transfer is the transfer of heat using electromagnetic waves. Objects at a temperature above absolute zero emit thermal energy due to the random movement of their particles. The thermal energy is emitted in the form of electromagnetic waves, which propagate from the object. The energy in these waves can then heat surrounding objects, fluids, and gases. Common examples of radiant heat include the heat we feel from the Sun and the heat used to cook objects in a traditional oven. A strip heater is a flat device mounted on a surface used to heat either that surface or the surrounding air. Finned strip heaters have fins that optimize heat transfer. A Ring heaters is a type of strip heater specially designed to heat round shapes such as the bottom of a tank, dies, or molds. An Immersion heater is used to heat liquids, oils, or other viscous fluids directly. Immersion heaters are installed into the tank holding a liquid. Since the heater comes in direct contact with the fluid, they are an efficient method of heating liquids. Immersion heaters can be installed through a variety of options in a heating tank. A tubular heater is typically used to heat air, gases, or liquids by conduction, convention, and radiant heat. An advantage of tubular heaters is that they can be designed with a variety of cross-sections and path shapes to optimize heating for a specific application. A duct heater is used to heat air passing through air ducts. Duct heaters are available in square, round, coiled, and other shapes to fit easily into a variety of HVAC and industrial ducts. Rope and band heaters are flexible heaters used to wrap around pipes, beakers, and other round surfaces. Rope heaters are especially useful for pipe or tank tracing. flexible heater is a device that can conform to the surface that requires heating. This allows for optimum contact and heat transfer. Flexible heaters are typically used to wrap around pipes, tanks, drums, or irregular shapes. A drum heater - or tote heater - is used to heat liquid drums or gas cylinders. Tote heaters encapsulate a tank or drum and are used to keep it warm. Other types of drum heaters, such as flexible silicone heaters, bond directly to the drum. It is important to consider the specifics of your application prior to selecting the heater to use. Of primary concern is the type of medium being heated and the amount of heating power required. 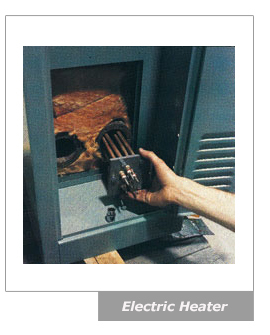 Some heaters have been specially designed to function in oils, viscous, or corrosive solutions. However, not all heaters can be used with any material. It is important to confirm the desired heater will not be damaged by the process. In addition, it is necessary to select an electric heater that is appropriately sized. Be sure to determine and verify the voltage and wattage for the heater. One important metric to consider is Watt Density. Watt density refers to the heat flow rate per square inch of surface heating. This metric shows how densely the heat is being transferred.